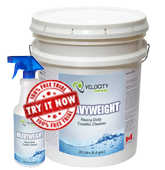 HEAVYWEIGHT is a heavy duty, caustic liquid cleaner used to remove road film, grease and pitch from machinery and exterior surfaces. It is used by railroads, mines, pulp and paper mills, as well as maintenance shops to remove oil and grease from heavy machinery and component parts. It is also used in plywood plants to remove pitch from driers. Foam application – use at up to 20% for heavily soiled areas. High pressure wash – 0.5% – 1.0% at the tip. Pitch removal – for cleaning of plywood driers dilute to 10% concentration (foamed or sprayed). Contact time is 15-30 minutes, depending upon soil.